Home / gpt sites / surveys / How to make money from Clixsense? 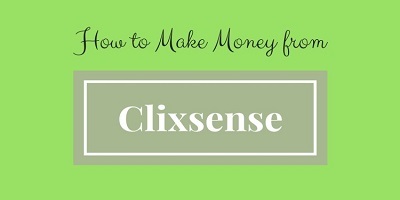 How to make money from Clixsense? Clixsense is the oldest and most trusted paid to click program in the world (edition: 15 July 2017, the site has slightly changed the business model and deactivated the PTC function). Service based in Hampstead (North Carolina - USA), has been operating since February 2007. Currently, he has over 7 million members, whom he has already paid almost 23 million dollars. The owner of Clixsense.com is American Jim Grago. Completing various tasks (TASK) - earnings for each task from a few to a dozen or so cents. offers (Offers) - a similar situation as in tasks. Inviting friends (referrals) to use the platform, where for a direct referrals we get $ 2 if the condition is met - that is, our registered will earn a minimum of $ 5. Is it possible to earn on Clixsense? Within a month you can reach a dozen or so dollars, but the case is different when you invite friends, family (here note not to register two accounts from the same IP, probability of blocking accounts), or anyone you want, even on Facebook, YouTube you acquire referrals, for each of them you receive $ 2. Of course, it's good if these people also act persistently in ClixSense, because you get commissions on their earnings. The Surveys tab takes the user to the panel of surveys, differentiated on individual publishers and with different values. To be able to receive and fill them, we need to complete our survey profile. To do this, go to the Surveys tab and then click on the - SURVEYS PROFILE button. Then on the next pages, we complete our data. Tasks (tasks) are a very good method for earning money on the site. They are commissioned by an external company - Figure Eight. What is the job? Above all, you can search for information about a particular company in the text, its address, telephone number, product classification or tweet rating. To be able to earn money on tasks, you need to open a free account on the Figure Eight portal. You can do it by clicking on any offer from the Tasks section. To get a daily allowance for general income (for surveys, offers and tasks), two simple conditions must be met: complete a minimum of 10 tasks, complete 2 surveys or offers. For fulfilling these requirements, you will receive a 12% bonus for daily earnings (the prize will be added to your account within 24 hours). So if on a given day you earn, for example, 5 dollars and you meet the conditions of the daily bonus (12%), you will earn an additional 0.60 $. An additional 2% can be obtained by installing the ClixAddon add-on and leaving it enabled for min. 1 hour a day. Another 2% can be obtained by completing the daily bonus for 3 consecutive days. By adding all bonuses, you can claim up to 16% extra bonus on daily earnings for free. Bonuses have no limitations - you can receive them for as long as you can meet their conditions. The tool that makes working on CS very easy is ClixAddon. It is a free add-on to the browser (Chrome, Firefox, Opera), which informs us "live" about available surveys and tasks. The add-on can be downloaded from the link placed at the very bottom of the main page. How to withdraw earned money from Clixsense? The minimum amount we can wihdraw is $ 10. The program supports several payment processors: Skrill (the most profitable), Payoneer, Dwolla, Tango Card and Neteller. Clixsense is the best choice if you're looking for a reliable and proven website to make money online. The site pays money to users from the very beginning. It is one of the few websites offering 30% of the referral earnings and additional cash rewards for his activity. It has a lot of offers available, so we have more opportunities to earn.